While free-to-play games are already huge money-makers for mobile and browser developers, console developers are racing to secure their own piece of the pie. At this year’s E3 in Los Angeles, Sony announced a variety of free-to-play titles for its PlayStation 3 and PlayStation 4 home consoles and PlayStation Vita handheld gaming system. The PlayStation F2P campaign will offer a variety of gameplay experiences (many social) to users, available at no initial cost. From there, it will be up to gamers to decide how much (if any) they wish to support the games with in-game purchases. Here’s a brief look at some of the first-party and third-party free-to-play games in the lineup. Guns Up! (PS3, PS4, PS Vita) – Guns Up! is a free-to-play strategy game where players take on the role of a General, managing resources and deploying the right combination of troops, land mines, air strikes, and smoke screens to destroy enemy bases and conquer new territories. Fat Princess: Piece of Cake (PS Vita, Mobile) – Launching later this summer, Fat Princess: Piece of Cake takes the comic medieval battle royale to the next level with a brand-new strategic match-3 free to play puzzle game. Wrapped within the beloved universe of Fat Princess, you’ll charge into battle with four different character classes to rescue the princess. Throughout the battle, collect gems to upgrade troops, feed cake to the princess to unleash slam attacks and trigger massive combos to save the kingdom. 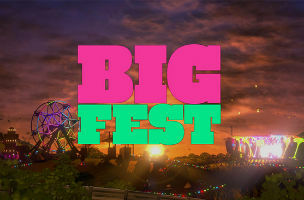 BigFest – With the help of Big Dave and a crew of trusty roadies, BigFest gives music-lovers the ability to discover real-world music talent and build the ultimate music festival. Partnering with one of the world’s largest free music platforms, players help real-world, unsigned artists climb the charts as they build their mega festival. PAIN Free to Play (PS3) – PAIN Free to Play is a wild, physics-based game where players load characters into a super-sized, ultra-powerful slingshot and launch them into an active, physics-controlled environment to cause destruction and pain. Kingdom Under Fire II – Kingdom Under Fire II is brand new style Action RTS, which players can control both Troops and Hero at the same time. As a F2P MMO Game, players can evolve from a novice mercenary up to the ultimate conqueror of the world and can explore massive scale battlefields with other players. Reaper – Reaper is an action RPG platformer directed by Luc Bernard. The player will take control of one of Death’s reapers who decides to turn on Death after she sends him to take the life of his own daughter. You will be able to collect over 100 Soul Cards at launch, which will go from simple things such as equipment, to more powerful cards like Summons and Spells. Onigiri – The MMO Onigiri is the tale of another world, based on the myths, fables, stories, and legends of old Japan. You, a descendant of the ancient Oni, and your eight companions, must set forth against the Kamigui and their hidden masters, the Goikkou. PlanetSide 2 – PlanetSide 2 is a revolutionary massive scale first-person shooter where soldiers battle as one in strategic, targeted missions against enemy empires in an all-out planetary war. The game challenges the skill and grit of the most seasoned soldier through intense infantry, air, and ground vehicle gameplay. My Singing Monsters (PS Vita) – My Singing Monsters is a world-building game where the player collects and breeds adorable monsters. There’s a big difference to this game, however, that sets it far apart from others of the genre; these monsters sing, play, and dance! Each island has its own song and is packed full of incredibly cute monsters. The new Yawstrich and G’joob monsters, which are only available on PS Vita, will enhance your islands and make them like none the world has ever seen! Loadout (PS4) – Loadout is an outrageous multi-player shooter that’s all about the guns. Build a massive variety of absolutely insane weaponry – billions of combinations – totally customized, totally unique, and totally deadly. War Thunder (PS4) – Making its console debut on PS4, War Thunder is a cross-platform next generation MMO combat game dedicated to World War II military aviation, armored vehicles, and fleets. You will take part in all of the major combat battles, fighting with real players all over the world. War Thunder is available now on the PlayStation Store.